I got the testing Android 2.0 image from http://android-x86.org. I had the 1.6 "stable" one but it was... well, it worked awful (half the key combos or menu options caused it to crash, reboot or otherwise autocombust). So... how is it working? Slow, but it has potential! It boots quite fast... but my tricked full Arch Linux install boots faster. It works sloooooow, you can see individual letters when you type in the search gadget. I read this is a temporary problem, though. No semi-decent word processor? Not even one that generates HTML? The web browser is pathetic. It may be nice for a phone, but for a "real" system? It's awful. You get the mobile versions of all sites (obviously) and many don't let you switch to the real ones! (even google does that, for Google Reader), and of course, no flash. The email app is terrible. You can't not-top-post!!!! "In-Reply-To" is off-spec! The WiFi settings are way too hidden. They should pop if you click on the wifi icon. It shuts down incredibly fast. Some apps are quite nice, specially the Aldiko book reader is awesome (and I can share the ePub books with fbReader on the arch linux side. The included SSH client has great ideas. The "everything fullscreen all the time", thing? works on this screen. App installation is a solved problem here. I know I will be able to get Qt working native... can't wait! I am getting a touchscreen for it, so I can experience it more the way it's meant to be experienced. I am using it a lot to read at night in bed (Just finished Makers, read it, it's cool!). I am using it for casual mail reading (I refuse to reply with that broken app). It's a pretty nice alarm clock, so it's becoming my bedside OS. I'll write another report once I have the touch screen or a new (hopefully faster!) version running. I have worked really hard on Marave, a full screen editor in the style of ommwriter, DarkRoom, WriteRoom, pyRoom, etc. I have worked very hard and I want users to use it. Or not even that, I want them to have a chance of using it. That means I want it to work on Windows (and maybe OSX some day, too, if someone helps me). 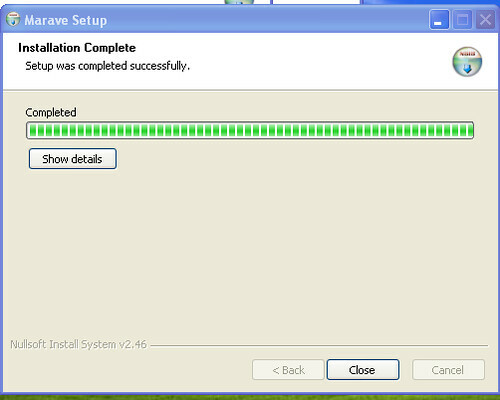 Which means, I have to pakage it for windows. Let's do a quick comparison here from the points of view of the user and the developer. This is in Arch Linux, which is what I use, in other Linux variants it will be pretty much the same once Marave is a bit more well known. That gets the code from SVN (right now it's the best way, later I will package releases, too), all required dependencies, builds and installs. It takes all of 15 seconds in my notebook. After that, you have a fully working Marave. You go to http://marave.googlecode.com, click on "Marave-0.5.win32.exe" (Not linked yet, it's not finished), then download a 10MB program. That is a 10MB program because windows doesn't believe in packages and dependencies. On Linux, a Marave package could be under 1MB (most of it images), and not be executable, just data. Of course nowadays web browsers don't actually run programs on download, so... let's see it as a gallery! Since Marave is a new app, and I develop it in the rather cutting-edge Arch Linux, it uses some newish features only available in recent versions of Qt. In fact, it doesn't work with PyQt < 4.6, which is not available in some slow distros, like Debian, or even in a not-latest Ubuntu. Solution? Well, I could just ignore it, but what the heck, let's fix it instead! Use this, and PyInstaller will produce a nice folder full of everything Marave needs to run on any Linux. pkgdesc="Create PDFs from simple text markup, no LaTeX required." And that's all you need to know about the process of packaging your app for Linux. It's easy to do, and most of the time, easy to do right! First, remember that of relying on the system's version of Qt? Forget it, there is no system version available. And no python either. And noone is going to install it or your app, so it's "ship everything yourself" mode, or nothing. But anyway, PyInstaller works for Windows too! So, using the same spec file, it works. Right? Well, no beause of two problems. Users are not going to open a zip somewhere, then do a shortcut to the binary on Windows, so you need to do some operations, and that means an installer. 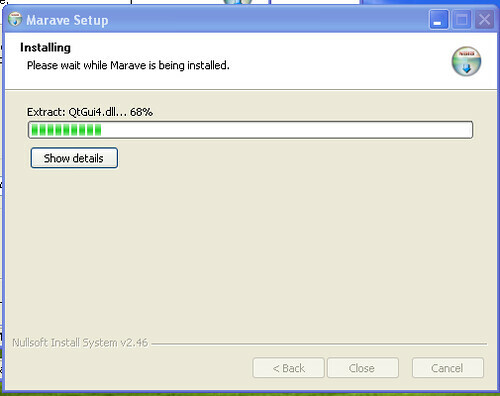 CreateShortCut "$SMPROGRAMS\Marave\Marave.lnk" "$INSTDIR\marave\marave.exe" ; use defaults for parameters, icon, etc. 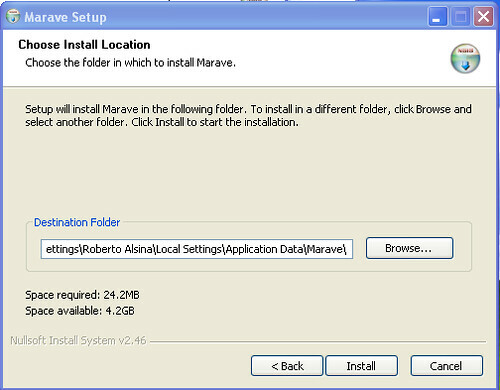 CreateShortCut "$SMPROGRAMS\Marave\Uninstall Marave.lnk" "$INSTDIR\Uninstall.exe" ; use defaults for parameters, icon, etc. It's comparable to the effort of building a packaging file, really, except every time you want to test it... you install it. There is no way (AFAICS) to see what's inside the installer except running it! When things fail, you get no error messages, at least not the kind that is useful for a developer, the guy that needs to know what went wrong. On Linux that's part of the system. Further, if you wanted, you can redistribute it. On Windows... well, it's a bit different. It's part of the "Visual C++ redistributables"
The license for those 'redistributables' says you can't make them available for download. I have been told that including that in your installer is fine and dandy, but how is that not making them available for download? So what can you do when you need a library and can't ship it and the user won't install it? 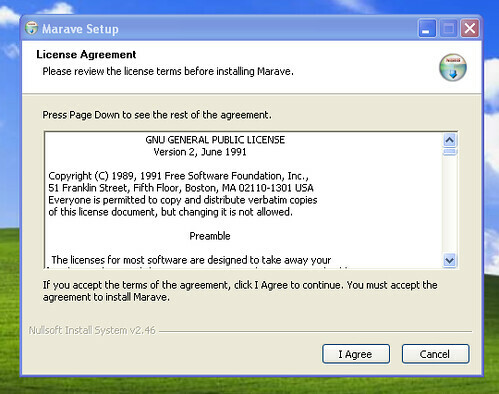 Well, that's why there is no Windows binary of Marave yet. Of course if anyone can help, I'd be really, really happy! Most people nowadays have more than one computer. Often, you are using one, and would like to do something in another. In this video, I will explain how trivial it is to do that without leaving your seat in a modern Linux using KDE. Avahi, a zeroconf implementation to let you find your computers in your network without worrying about IP addresses, DNS, etc. krfb, the KDE Remote Frame Buffer. This is a program to share your desktop over the network. krdc, the KDE Remote Desktop Client, a VNC, RDP client, which is what you use to see a desktop shared via krfb. Keep in mind that accessing remote desktops over the internet is a whole different beast, and this solution is not meant for that case. As usual, this video was recorded using qt-recordmydesktop. There was minor editing using mencoder. 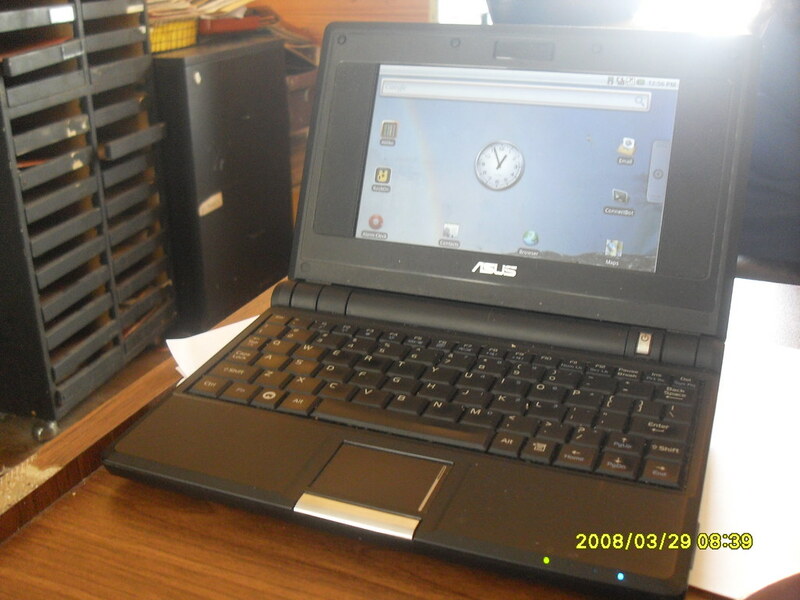 The computer used is the original Asus eee PC 701 4G, so you can see this is not exactly a hardware-intensive operation. I find the eee's small screen is great for this kind of full-screen demo, because it's not big enough to drown the important parts. My post about Arch Linux from yesterday got posted at tuxmachines and there was a comment there. I can't find a place to get an account. Hey, it's my own blog, so I can do whatever I want. 1. Too many ArchLinux users think gnome/kde are bloat and instead install some half developed window manager and some terminal emulator and call it a "minimalist" desktop. Why is that any of your business? And what "compromise" is there? 2. Optional dependencies are the worst idea ever. If a package is linked against libsomething.so then libsomething should be a dependency not an optional dependency. Making libsomething an optional dependency just because "minimalist" users don't want to install dependencies is plain stupid. That's not what optional dependencies are for. For example, consider the example I mentioned, rst2pdf. It can use pythonmagick. It can also not use it. You will lose one small feature that AFAIK only one person ever used. If you need that feature, the manual tells you what to do: install pythonmagick. Maybe there should be a pacman option "install optdepends" which turns optional dependencies into regular ones. That would make you happy and keep others happy too. 3. Bad leadership. Aaron is fantastic guy but I know at least two ArchLinux developers who can do a much better job. That's just stupid and mean. 4. Too many ArchLinux users now like badly automation scripts like yaourt or whatever it is called. Parse error. And then again: yaourt is great. You don't like it? Act as if it doesn't exist and be happy. You seem to have a big problem ignoring people who disagree with you. That's a really, really serious personal flaw. I suggest you grow up. 5. Too many noobs who do dumb things like people adding their users to hal, disk and dbus groups. Sure, they should add themselves to optical and storage. So what? It's a simple problem and it has a simple solution. Then again, the adduser scripts probably should do that for regular user accounts. After all, who wants to create a regular user that can't use removable storage? And if said use case exists, that should be doable by removing the user, and not viceversa! On the other hand, I don't give a damn, because I can fix it trivially. The main reason why I don't think I will switch to another distribution soon is that creating Archlinux packages from scratch is very easy and the initscript system is really fantastic. All in all, ArchLinux is a really strong distribution now and it's constantly growing. I expect you, like most elitist poseurs, will run away when you feel Arch is too popular and accessible to "too many noobs" or some similar nonsense. Which, like the title says, is why you are a big part of what's wrong with Linux users. Yesterday I had one of those moments where I feel very happy about my distro of choice, Arch Linux. Since the last time I posted about Arch seems to have been over two years ago (time flies when you are having fun! ), I think it's time to explain it. I wanted to test rst2pdf against reportlab from SVN, wordaxe from SVN and docutils from SVN, and I wanted it to be simple. Solution: I just packaged them in AUR! Now, whenever I need to check rst2pdf agains wordaxe trunk, I just need to yaourt -S python-wordaxe-svn and I can go back to stable wordaxe with yaourt -S python-wordaxe. The svn package will always be the current trunk without any modifications, and I can switch back and forth in about 45 seconds, without messing up my system's packages. Also, I can keep my installed SVN packages updated by doing yaourt -Su --devel every now and then. How would I have done that using Debian or a RPM distro? I suppose by going around the packaging system (which I hate) or by doing a private repo (which is so ... lame?) or by doing a public repo (which is freaking work). Really, if you are a coder, I can't think of a Linux distro that makes life easier than Arch. Pretty much everything is there (12K packages in unsupported!) and if it isn't, it's a 5-minute job to slap it into AUR and help the community. Suppose you are doing a KDE app. On most distros you need to install your own from-source copy of kdelibs to have the latest and make sure it's not screwed by distro-specific patches. On Arch? Patching upstream is frowned upon. Not having the latest version is frowned upon. So it's pretty much the ideal environment to develop against KDE, or GNOME, or PyQt or whatever. If my life was not 150% committed already, I would try to become an Arch developer, or at least a TU (Trusted User). Maybe next life!